ATLANTA, GEORGIA, January 17, 2018—Advanced International Translations (AIT) has just released ExactSpent 3D, the latest version of ExactSpent, the personal time-tracking software for freelance translators. ExactSpent was created to help freelance translators count their time spent on a particular translation job, thus assisting them to accurately determine the value of the work performed, the equivalent payment, and even their own productivity. The specific nature of translators’ work is that it is often hourly paid, and that is why it is so important they have at their disposal software able to accurately count their time spent on jobs. ExactSpent is exactly the tool translators need. Time is relative, so professionals cannot just rely on their own perception of time. Sometimes administrative tasks, such as correspondence with clients, phone calls, invoicing, billing, and dealing with organizational matters, take much longer than expected. ExactSpent allows counting all the time spent and then distributing it among the different tasks so that users can claim fair payment for their work. 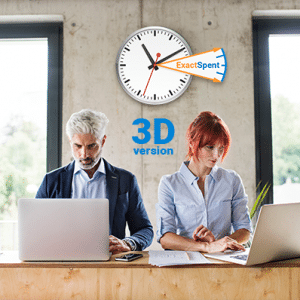 Users who manage translation jobs with Translation Office (TO3000) daily can benefit from integration with ExactSpent as it’s now possible to open the tool directly from TO3000 to start to count their time. After finishing a job, a user can import the counting results in just a few clicks. AIT is the leading supplier of translation management software for translation agencies and freelance translators. Since 1998, AIT has developed 11 software tools for translators and language-service providers. AIT released its first translation management software in 2001, and it now has more licensed users than any other company of its type. ExactSpent is personal time-tracking software designed specifically for in-house and freelance translators, editors, proofreaders, translation project managers, and other experts in the translation industry who charge by the hour. ExactSpent is the fourth product in AIT’s successful product line of efficiency tools for translators. AnyCount — the most accurate word count software—de facto industry standard word count software covering 36 file formats. Translation Office 3000 — easy-to-use translation management software for freelance translators that optimizes accounting of translation jobs and ensures efficiency and profitable business. Projetex — industry-leading translation management software for translation agencies. ExactSpent — is the personal time-tracking tool. For detailed information about ExactSpent, visit https://www.exactspent.com.